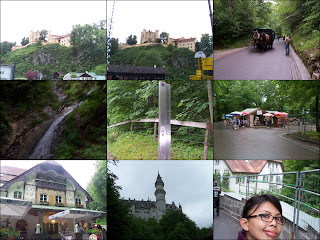 Note: this is not so budget idea of traveling in Germany, but its worth the trip if you see the castle your self. 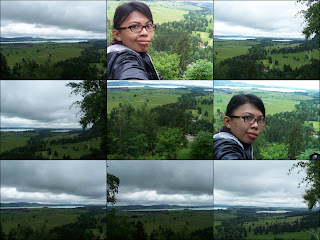 The Königswinkel or literally Kings Corner is a large area of natural beauty. It includes the towns of Füssen and Schwangau as well as Pfronten and the resort village on Lake Hopfensee. This is as part of the romantic road that i mention before.... romantic roads is the trader roads its consist of the most breathtaking scenery and most beautiful medieval castles and parks in the world..
To get here by train just take the train (Deutsche Bahn) to Füssen direction, then at Fussen station take the bus RVA/OVG 73 in the direction to Steingaden / Garmisch-Partenkirchen or the bus RVA/OVG 78 in the direction to Schwangau until you reach the stop Hohenschwangau / Alpseestraße. 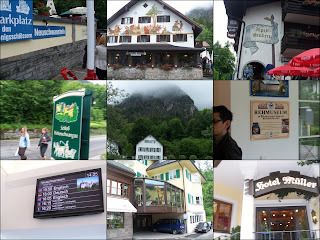 From here you could either goes by foot or use bus with departure point: Schlosshotel Lisl. 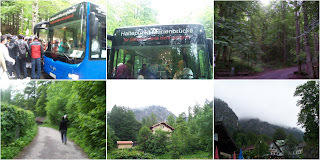 The bus goes via Bleckenaustraße to the "Jugend" lookout point (Marienbrücke) from where it is about 600 m or a 10-15 minute walk on a steep downhill path to the entrance of the castle (its beautiful!). On the bottom of the castle we go to the parking and walk for around 1 kms for the ticketing and information on a building "Konigs Schlosser" with grey roof near the Mueller Hotel. You could get the ticket for both castles online too. But the day i went there there are less queue so we could get the ticket pretty easy. On the ticket printed the TIME TO ENTER THE CASTLE, please notice this, as you will need to be at the castle entrance as the printed time there. Also your group numbers and the ticket only valid for the day on the specific tour only. So with less time we watch the horse carriage humm its pretty slow... the horse carriage is 6 Euro uphill and 3 Euro down hill, and you have wait in front of Mueller Hotel for the horse carriage. As for us, first we plan for the horse ride. And I am afraid of horse hahaha... then we decide to walk up. I told Mr T that i am more firt than him, as last time we went holiday in Macau he can't walk too long! we race to the top. The temperature its too cold for me, maybe around 14-15 degrees, so i like running or walking fast to make me feel warmer! Race to the castle its good when its cold! Its is worth the walk the view above is beautiful i can't help it but stand still there, try to catch every glimpse of it. 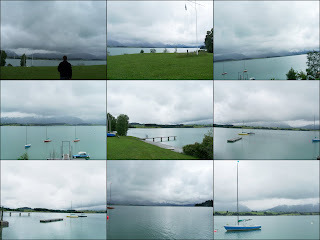 The smell of fresh air and the grass.. the view of mountains and lakes... also the sound of winds, the sound of cow bells, and some goats.. i feel this is Germany! hehehe somehow very different... skies blue and everything beautiful! This castle built meant to blend with the scenery surrounding it. Its just looks like a huge play stage. 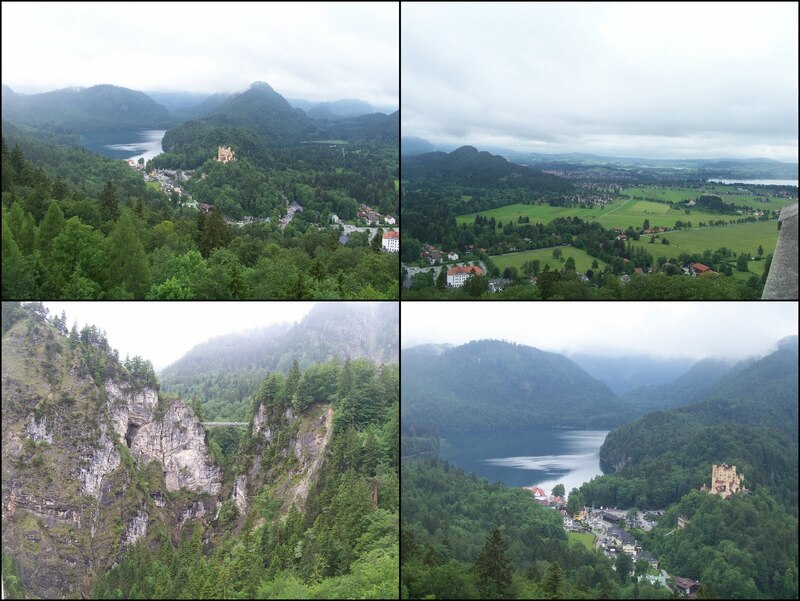 The backgrounds with mountains, lakes and King Ludwig beloved land the Bavarian land... stood still with grace the wonderful Neuschwanstein Castle. Tragically, this castle was built be a private refuge, “sacred and out of reach” (“heilig und unnahbar”), but these days host to thousands of tourists each day. 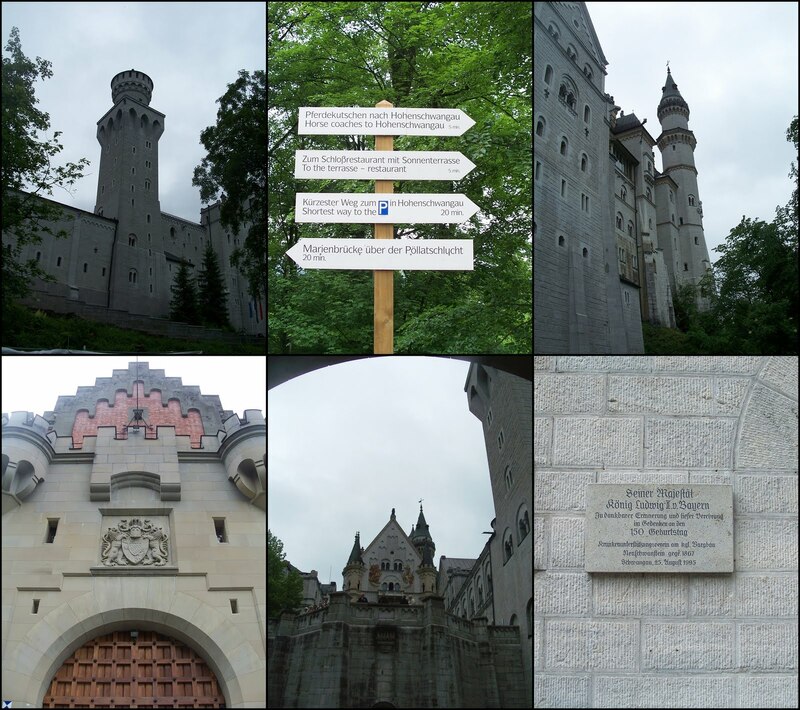 Another irony: although it was built largely as a stage for Wagnerian productions (“a worthy temple for the divine friend [Robert Wagner]”), the composer never set foot in Neuschwanstein. Nor was the castle’s throne room ever completed in time to contain a throne it self. 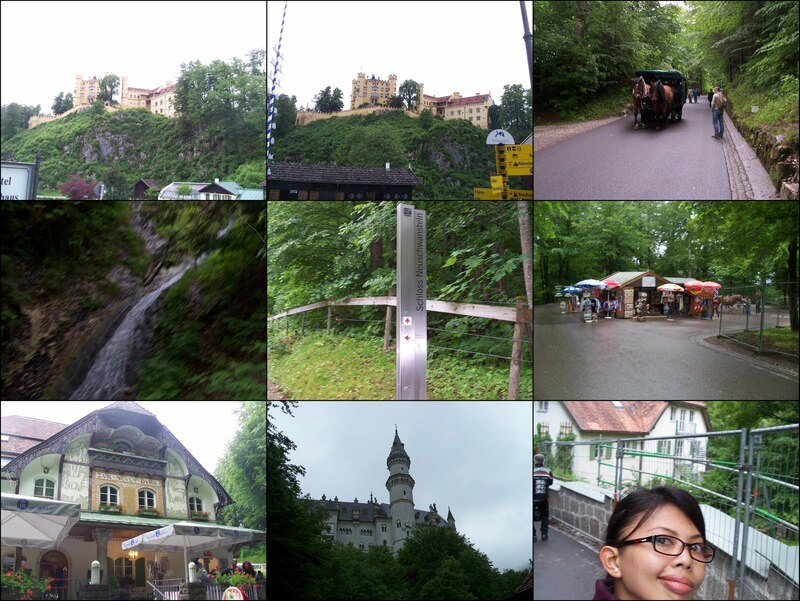 This castle project named by Ludwig with “Neue Burg Hohenschwangau” or “New Castle Hohenschwangau” because it was build on a castle ruins. Only later, when the castle was opened to the public on August 1, 1886, just weeks after Ludwig’s death, did the edifice come to be known as “Neuschwanstein” (“new swan stone”). I think its related to most of the castle detail with swans his fave animals (door handle, pictures, water tap, etc) but swans also a heraldic animal of the Counts of Schwangau, whose successor the king considered himself to be. 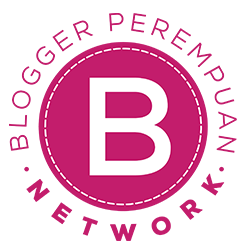 It is also the Christian symbol of the "purity" for which Ludwig strived. Just too bad that we can not take pictures inside the castle! the tour took 36 minutes and i felt like in a movie already! its just like storybook... everything..it was built 1868 but everything still in good condition. My fave room would be the king chambers ofcourse. Its fascinate me because he had his own reading corner. Also everything with swan :) and ohhh had to see the King toilet.. very first modern toilet with flush.. hahah if you consider this is important the castle also had forced air central heating system (i think this is a very good fact). The kitchen also amazingly modern for a building that built in 1800. Everything is modern! well you wont find any electric stuff yet here.. but its just like a normal kitchen these days! well the castle construction it self last until 23 years even after the king death! Oh another sad part.. king only spent 11 days here in the castle! after all of the hard works! After finishing touring inside we walk to the Marienbrucke. A stunning bridge where you could see the castle from distance. It was amazing! i think this is also the best spot for taking Neuschwanstein castle pictures. 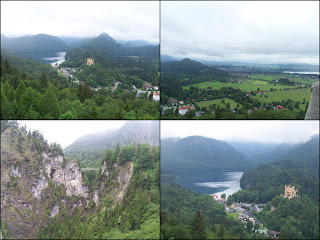 View from Marienbrucke-good for bungee jump! The bridge also had lots of lock with names.. just the same with Paris.... and some are soooo romantic!! *sigh* see... this is why i said its just romantic!! Its not a nice thing to do... i hate it when someone do that to a long queue. The temperature down again until i could see fogs when i breate.. so i can not stand still any longer, i told Mr T better if we walk.. so we did! We walk down the hill and he took unusual path, that i swear if we ever got lost i'm going to bite him!! grrrhh! but then we arrive near the parking but don't try the alternative roads its very slippery!